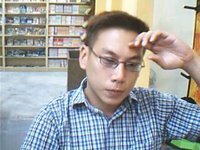 I am now posting from Techi comics shop http://www.tenchicomics.com/ It has been a very stressful day for me. Coming from a place I really feel uneasy in the afternoon. Anyway I am very mentally drain . I manage take a photo of myself to show the state I am in now with a web camera they provide.